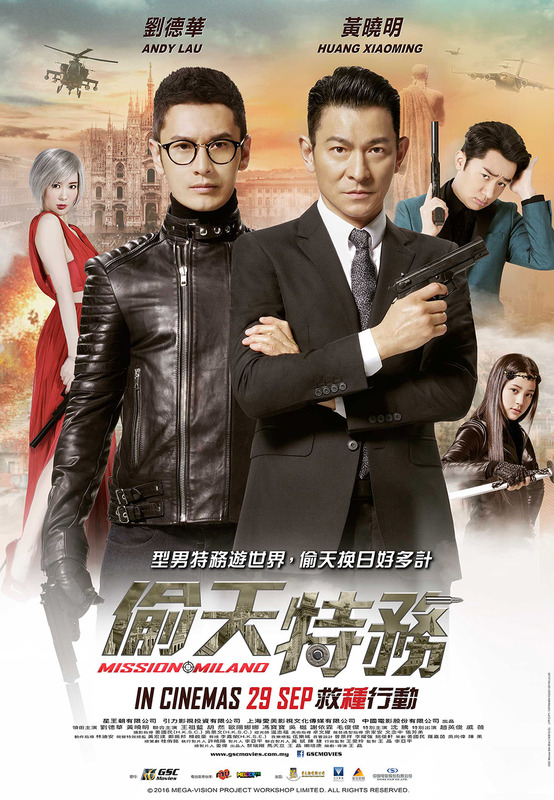 Mission Milano is an adventure about a wealthy entrepreneur (Huang Xiaoming) who goes undercover with an Interpol agent (Andy Lau) to protect a new invention, Seed of God, from falling into an international crime conglomerate. Together they embark on a journey to protect the invention & travel to multiple cities like Macau, Hong Kong, Milan & Eastern Europe. Will they be able to accomplish their mission…? When you see a film by Wong Jing, it will mean that the movie will be a seriously dottish. I was pretty on point about Mission Milano. Watching two good looking actors – Huang Xiaoming and Andy Lau plot against one another before working together made the brainless film a little or endurable. While there were several well-known comedians – Wang Cho-lam and Evonne Sie, I was surprised how Huang Xiaoming who was known for his solemn (+eye-candy) roles (The White Haired Witch of Lunar Kingdom and The Return of the Condor Heroes) went all out to be funny. Well, Andy Lau had his fair share of slap-stick comedy films, so it’s really just watching him doing his signature moves. There were many grand and beautiful set as the team visits different countries to save the “Seed of God”, but the plot is pretty predictable and classic. Also, there’s no weird dubbing, so we all get to hear the characters’ original voice! If you are looking for a light-hearted comedy-action film which doesn’t require much thinking, Mission Milano is definitely your go-to film. Andy Lau was not just the main lead, but also the executive producer of this film. He was around on set , providing opinions about the cinematography and action sequences himself, leading the team to create many comedic scenario. Huang Xiaoming admitted to accept the role immediately upon hearing that he would be working with his idol Andy Lau. Ouyang Nana was treated like a daughter by Andy Lau in this film. During free time, Andy Lau taught her how to perform magic and Huang Xiaoming asked her to be his god-sister. She accepted it after hearing she was the first person he asked. Check out Mission Milano (偷天特务／王牌逗王牌) Facebook Page! Mission Milano (偷天特务／王牌逗王牌) is out in cinemas on 6 October 2016. Simple but fun flick alright. Best moment was the reunion of Lau and Sammi Cheng, that was a very nice nod. Ou Yang Nana should shows her BRA and UNDERWEAR also,that Huang Xiaoming sister.How can Wang Cho Lam only show underwear!!! !Embarrass men only! Looks like a nice light hearted, comedy action. I like those kinda esp when brain is too fried up and I need some relaxation. I like to watch these types of movies. Stress busters they are! providing right amount of fun, action. That sounds like the classic combination of comedy and action, I like watching movies like that when I have free time because it’s not heavy like drama, it’s light and easy to watch. I’m sure this film is fantastic! Watching a comedy-action movie is a great way of entertainment. I know Andy Lau but not that big of a fan. I think this is worth my time to watch. Why did the characters have to dub? The stakes are really high in their mission. It would definitely be heart beat stopping following their adventure. it is so surprising that there are so many movies from different countries that have good story lines and production but we only view what our own countries make. I wish these movie distributions become more global so that we all can watch movies from different countries. I have never watched a movie from Hongkong before, imagine! never seen a site that reviews movies as perfectly well as you do. nice job and keep doing what you know how to do best. The poster and stills do not really attract me to watch this film. I like my crime dramas more gritty and realistic, than too stylish. As always, you’re always feeding us a good review of a certain movie. I’ll definitely watch this movie soon. I love the concept of this movie, this turned to be an interesting movie that everyone must watch.